Rock & Roll Hall of Fame inductee, R&B Pioneer Award Winner, and original founding member of Sly & The Family Stone; Jerry Martini, along with Phunne Stone (The multi-talented daughter of Sly Stone and the late great Cynthia Robinson) bringing the music of the first inter-racial inter-gender, main stream-stream major band in Rock & Roll history.. the chart topping hits of Sly & The Family Stone. 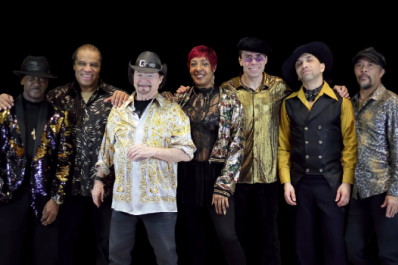 These funksters are joined by the powerful voice of Swang Stewart on vocals, bringing a message of peace, love, and social consciousness, through musical harmony with some of the funkiest players of all time. Big Gunes of Funk like Nate Wingfield on the Guitar, Jimmy McKinney on keys, Frank Klepacki on Drums, and Blaise Sison on bass adding the proper pocket to the raw Family Stone sound. 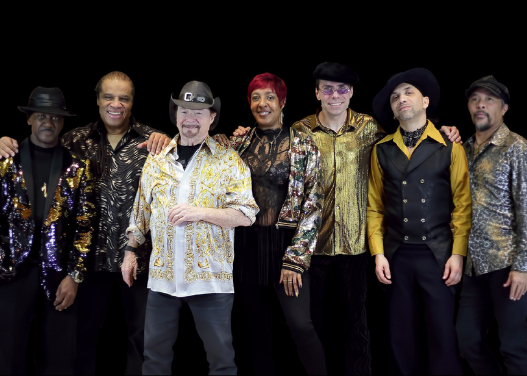 They present an explosive set of their Psychedelic Funk classic hits of the 60s and 70s. The raw, unfiltered original sound that became part of the essential building blocks of many, if not most, of the great modern artists toolkits. Sampled and covered by major artists around the world, the influence of their music and sound is immeasurable in the development of modern music as we know it today. Shaping the music of artists like Micheal Jackson, Janet Jackson, Prince, The Jackson 5, Miles Davis, Run DMC, Dr Dre, Snoop Dogg, Chuck D, John Mayer, John Legend, Madonna, Aretha Franklin, Doris Day, Lenny Kravitz, The Roots, The Beastie Boys, 2pac, The Gorillas, Digital Underground, LL Cool J, Ice Cube, Fatboy Slim, A Tribe Called Quest, Arrested Development , Maroon 5, Brandy, Cypress Coolio, Queen Latifah, The Beach Boys, Massive Attack, Tony!Toni!Tone!, Black Uhuru, Will i Am, Outkast, Cee Lo Green, Steven Tyler, and countless other mainstream top 40 artists too numerous to mention. Legendary Anthems like "I Want to Take You Hig her," "Everyday People," "Thank You Falettinme Be Mice Elf Agin," "Dance To The Music," "Hot Fun In The Summertime," "Family Affair," "Sing a Simple Song," and many other instantly recognizable tunes from their vast catalog of albums including the album "STAND" which in 2015, was declared a National Treasure, preserved in The United States Library of Congress. In 2015, "STAND" was also inducted into The Grammy Hall of Fame. Keeping the legacy true to its original sound and raw funk groove, these "Everyday People" will naturally "Take You Higher" with a musical experience that has brought them in front of millions of people through Europe, Asia, Australia, The USA, and The Caribbean; appearing at massive gatherings like WOODSTOCK , Glastonbury, Coachella, Stem Grove, Tokyo Jazz, Electric Picnic and Harvest Festival, while also enjoying smaller intimate Jazz clubs like Ronnie Scots, Dimitriou's Jazz Alley, and Ophelias; spreading the roots of funk that is truly a revolutionary act of music going onstage. "You Can Make It If You Try"